Not only are EVs 70% greener than gas cars, they’re cheaper to operate and maintain. EVs also perform better, with quick acceleration, smooth handling and a quiet ride. Battery-electric vehicles (or BEVs) run 100% on electricity with a battery pack that powers an electric drive train. When depleted, the battery is recharged from a wall socket or a dedicated charging unit. Plug-in hybrid electric vehicles (or PHEVs) also have an electric motor and battery but use a gas engine when the battery runs low. Electric vehicles (EVs) make sense for drivers and businesses in Ottawa – both economically and environmentally. Does Hydro Ottawa have a plan for EVs? Hydro Ottawa is committed to advancing the adoption of EVs and to expanding access to EV charging stations as part of our overall Strategic Direction. And we are acting on our plan to meet this commitment. In 2012, Hydro Ottawa joined Electric Mobility Canada, a national association “dedicated to the promotion of electric mobility as a readily available and important solution to Canada’s emerging energy and environmental issues.” And in 2014, we partnered with Pollution Probe to complete an “Electric Mobility Adoption and Prediction” study that examined the current and future impact of EVs on the Ottawa market and our city’s electrical infrastructure. Hydro Ottawa has added EVs to our corporate fleet and has installed EV charging stations at our offices on Albion Road and Merivale Road. We are also working with the City of Ottawa, public organizations and companies to make EV charging stations available at more locations. Most recently, we collaborated with Tesla to install super-charging stations at the Rideau Centre. How much does an EV cost to buy and run? Electric vehicles start from as low as $27,000 and most sell for $35,000 to $45,000. Electric vehicles come in different sizes from compact to midsize to SUV, with more than 35 makes and models currently available, and more being announced every year. The average Canadian driver, travelling 20,000 km each year, can save as much as $2,000 per year on fuel alone. EVs are also much cheaper to operate and maintain than gas cars, saving EV owners thousands of dollars over the EV’s lifespan. For example, battery-electric EVs cost up to 75% less to drive than a gas car, saving the typical EV driver $1,500-$2,000 every year on fuel. How will my EV handle the winter? While charging overnight, EVs use electricity from the grid to warm and condition the battery so EVs start like a charm in cold weather. But extreme cold, –20⁰C or colder, can drop the range an EV can drive without charging, by 40 per cent because the EV must draw power to keep the battery warm and heat the car’s interior. Nevertheless, that’s still enough EV driving range on a single charge to meet the daily driving needs of most Canadians. EVs must pass the same rigorous safety tests as gas cars and are fully licensed to drive on Canada’s roads and highways. EVs also offer the same comfort options in winter that gas cars do, such as heated seats and heated steering wheels. What do I need to know about getting an EV Charging Station installed in my home? You must hire a Licensed Electrical Contractor to install the charging station and to ensure that the installation complies with all regulations under the Ontario Electrical Safety Code. You should make sure that the installer takes out a permit with the Electrical Safety Authority (ESA) before starting the installation of your EV charging station. You should confirm that all the installed equipment is certified for use in Canada by a nationally recognized certification agency – CSA, cUL, cETL – or displays other certification marks approved by the ESA. You and/or your contractor will receive a Certificate of Inspection from the ESA once the installation is deemed in compliance with the Ontario Electrical Safety Code. For more information about EV charging station installation, visit www.esasafe.com. 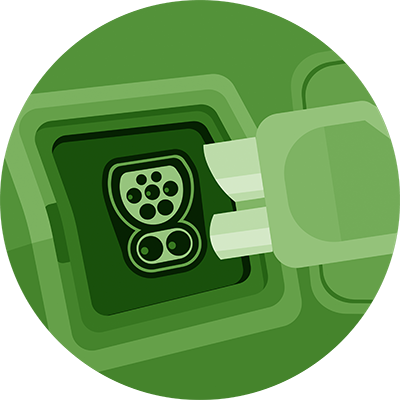 To find out more about EVs, visit Plug’n Drive. This non-profit organization is a trusted and unbiased source of information on electric cars and charging stations. How far can an EV run on one charge? Battery electric cars sold today can travel at least 120 to 200 km on a single charge, while plug-in hybrids and extended range EVs can travel more than 500 kilometres using a combination of battery and efficient gasoline engine technology. Since most Canadians drive 50 km or less per day, these travel ranges are well within the daily needs of most drivers in Canada. Note that EVs don't run out of charge unexpectedly. As with gas vehicles, a dashboard display indicates the level of charge and the estimated driving range. EVs also perform more efficiently at stoplights or in traffic jams. When an EV stops, its electric motor doesn’t draw energy from the battery, but gas engines continue to burn fuel even when stopped. All EVs come standard with a cord set that lets you charge the battery using a regular wall socket, also known as Level 1 or 110 volts charging. It can take 8 to 20 hours to fully charge an EV at Level 1. Level 2 charging stations use a 240-volt system (similar to a clothes dryer or stove plug) and can fully charge a battery electric vehicle in about 4 to 8 hours and a plugin hybrid in about 1 to 4 hours. In addition to recharging at home, you can recharge your EV at publicly available charging stations. There are more than 500 Level 2 (240 volt) and a growing number of fast-charging Level 3 stations in Ontario today. Level 3 stations can charge fully charge an EV battery in about 20 to 30 minutes. That’s at least eight times faster than a Level 2 charging station. Under the Electric Vehicle Chargers Ontario (EVCO) program, more than 140 Level 3 charging stations and almost 200 Level 2 stations have been installed across Ontario and more deployments are planned. Ottawa currently has nine Level 3 stations and six Level 2 stations installed, with more coming soon. Throughout the province, charging stations are typically located in or close to major attractions, restaurants, shopping mall parking lots, businesses and municipal properties for in-city travel. The Level 3 or fast-charging stations are generally located along highways and other major roadways to ease inter-city travel for EV drivers. How to I Find a Place to Charge Up? With an EV, you use no fuel or less fuel, which can reduce your vehicle operating costs by more than 50%. Electricity is cheaper than gasoline and EV maintenance is minimal. EV drivers save upwards of 60% on maintenance costs, because electric motors typically don’t break down as much as gas engines. Say goodbye to oil changes, fluid top-ups and broken mufflers. EVs are 70% greener than gas-powered vehicles and EV batteries are made from Lithium-ion, which are 90% recyclable. Electric cars deliver full torque right away, providing responsive, fast and smooth acceleration. EVs also feature remarkable handling and stability thanks to a lower centre of gravity. EV drivers in Ontario can get “green” license plates, allowing them to drive in all provincial high occupancy vehicle (HOV) lanes – even with only one person on board. 1. See the consumption of battery-electric vehicles guide from Natural Resources Canada. 2. The cost of one kilowatt hour (kWh) varies according to Time-of-Use (TOU) rates. 3. Average pump prices for regular gas in Ontario, taxes included. Sales of electric vehicles (EVs) are on the rise in Canada, leaving many with questions about the impact EVs will have long term on the environment and on the energy grid. With electric vehicles (EVs) becoming a more popular option for drivers, we are also seeing more and more public charging stations, generally called an Electric Vehicle Supply Equipment (EVSE) being installed. This is true both in cities and along major highways where the installation of DC-Quick or Fast Charging (DCFC) stations has grown significantly. Owning an electric vehicle (EV) these days isn’t any more complicated than owning a gasoline one. In fact, the argument could be made that it’s easier from a “fuel” perspective. While refueling gasoline vehicles require a stop at the pump to top up or fill the tank, the same can be accomplished with an EV by simply plugging it in. Electric vehicles (EVs) have been a hot topic for the last little while; after all of this noise on the subject you might be left thinking to yourself “can they really compete with a regular gasoline vehicle?” The answer is yes. Yes they can. As the technology associated with electric vehicles continues to develop, more Canadians are considering the switch to EVs. It’s 2018 and while we might not have the flying cars predicted by The Jetsons, the automobile has come a long way – or has it? ‘The GREAT-DR’ is a smart grid technologies trial project led by Hydro Ottawa and partially funded by the Ontario Ministry of Energy’s Smart Grid Fund.